With this 5 disk DVD set you can get in the best shape of your life and have fun doing it. . . all you need is a kettlebell, enough room to swing it and the SKOGG System. Michael Skogg’s innovative workout program will engage your entire body through a unique combination of kettlebell movements so you will get your body moving as a whole! You’ll “re-connect” your muscles so they start working together again – your body will perform the way it was meant to perform. And, you will look better than ever! The best part? Anyone can do it! Men, women, elite athletes, and even those just starting to workout. You can start at any level by choosing the size of your kettlebell, the length of time and the tempo of your workout. You’ll increase your strength, endurance, agility, flexibility and balance. You will get a sculpted, lean, and healthy body. Now you don’t need to switch between cardio and weight training. 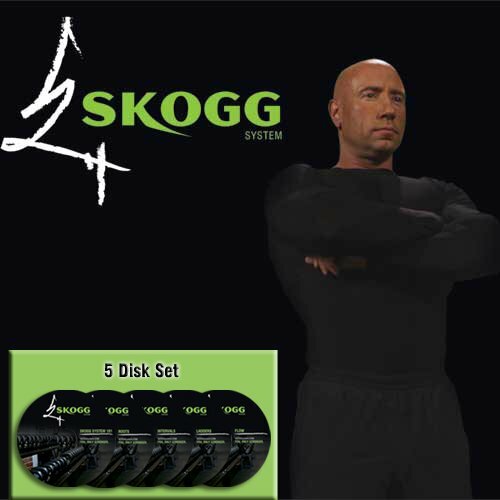 The SKOGG System is all you need to challenge your muscular and cardiovascular system simultaneously, burning more calories while strengthening and sculpting your body more quickly and efficiently than any other workout. It’s a full body workout in less than an hour. You will feel stronger, you will be stronger. The first in the SKOGG System series, the SKOGG System 101 DVD is all you need to master the 6 basic kettlebell moves. Plus, Michael will guide you through 4 individual workouts with 4 different fitness levels to choose from. Follow his workout schedule, and in just 4 hours a week, you’ll see amazing results. You’ll burn calories while strengthening and sculpting muscle, and you’ll have fun doing it! The SKOGG System YOU, ONLY STRONGER.